So, Mictlan isn't really thought of as a freespawn nation, and truthfully they shouldn't be. 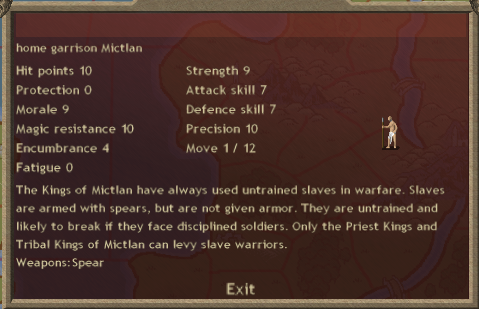 However, the commanders they can recruit from their forts and the priest-kings from their capital have a special ability (that I believe is unique to Mictlan). They can capture slaves from a province. 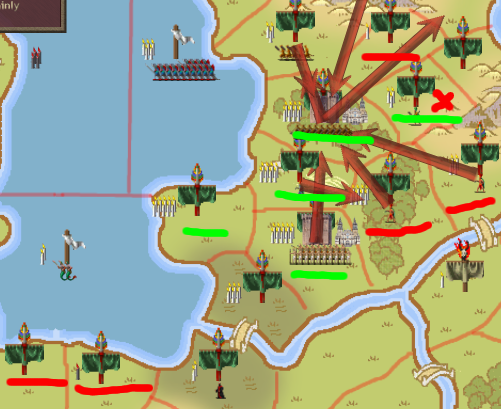 This sacrifices a very small amount of population (20-40 people) and nets you ~8 terrible units. The last two or three turns I've been using my starting commander to capture slaves from my capital. 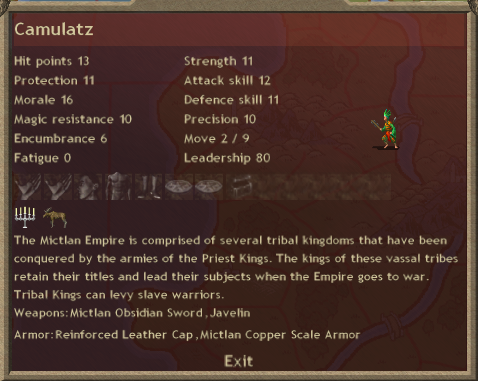 Then I've been funneling them to independent commanders I've recruited to act as squads of patrolling units. I am a huge fan of overtaxing, the value of gold declines as the game progresses, and I can extract gold from provinces with large populations now and then blood hunt them later! Currently the plan is to overtax provinces marked with a green dash. They all have either large population bases, or some kind of income modifier. The provinces with red dashes are ideal for blood hunting. They have populations somewhere in the 5k-6.5k range, which means they're right in the range where there is the least opportunity cost to blood hunt. Eventually, all of the provinces marked in green can become blood hunting provinces, but for now they still have extra gold I can extract from them by overtaxing and patrolling. The only exception is the province with a green dash and a small red x, it has something like 3k population, but a gold mine that adds 60 to the provincial income. This means that even if I lower the population of the province to 0, I can still extract at least 120 gold from it (a little bit more due to my positive scales). Edit: I should note, blood hunting drains population from a province. Not too quickly, but enough so that you're forced to move blood hunters around eventually. However, part of my build was to take growth 3, this largely counteracts the need to move blood hunters. You can essentially blood hunt a province for the entire length of a game without too much population loss.